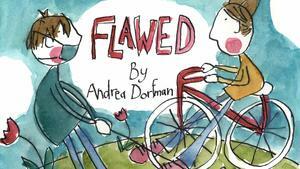 Flawed Take a moment and watch this wonderful PBS Video and spend a little time with yourself…. Artist/filmmaker Andrea Dorfman’s drawings burst colorfully into life as she animates the story of her long-distance relationship with a man whose profession – plastic surgery – gives her plenty of fodder. There is only one of you in the entire world, there has never been and there will never be another you. You are unique. For you to feel you are not good enough, for yourself or anyone else, IS NOT OK.
YOU are the present, not the wrapping paper… If you’re just thinking about how you look, you’re not thinking about who you are. Being a good parent or friend, for example, is how you make a difference in this world. If you see yourself unrealistically…and only the flaws (“I’m ugly” or “I’m fat”), all the surgery in the world isn’t going to make a difference. If you don’t change how you see yourself, you’ll never be happy. What are you telling yourself that makes you think you need surgery? Are you negating your positive qualities (honesty, loyalty, intelligence, humor, etc.) and hoping that plastic surgery can make you perfect? Want to get “fixed”? Only you can do that. You can’t buy self-esteem; you need to have a healthy body image. A surgeon can’t fix that, only you can…from the inside out. You have cosmetic surgery for you… not because of what someone else thinks. You’re in charge of your self worth. It’s not about what everybody else thinks about you. It’s how you feel about yourself. If you are going to do it…do it for you. If you know you want to get cosmetic surgery, then make sure you know and love yourself first. Know who you are and what you really want from plastic surgery and BE REALISTIC IN YOUR EXPECTATIONS.